Welcome to another installment of RETRO REVIEW, where where we take a look at films made before the year 2000. 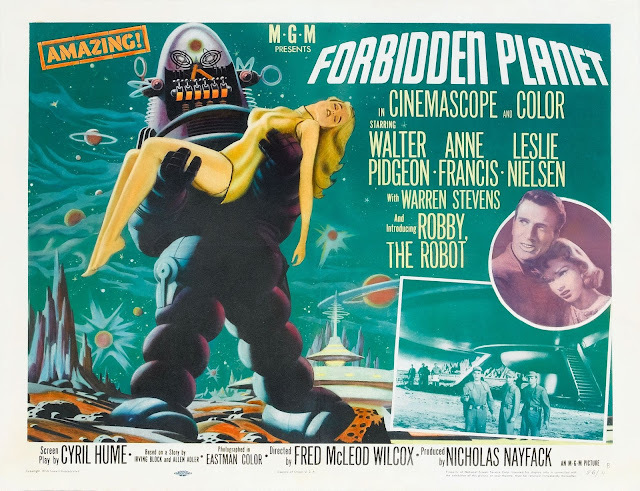 Today we review the 1956 sci-fi classic, FORBIDDEN PLANET. Enjoy! Howdy fellow film freaks, Robert here. Forbidden Planet, in addition to being one of the great gems of the golden age of sci-fi, is also one of the most influential such works to come out of that time, possibly the greatest of them all. Its story of a ship's crew exploring the unknown in deep space and their captain, who has the heart of a warrior, the mind of a philosopher and the soul of a poet, is instantly recognizable to even the most casual Star Trek fan, as the film was one of Star Trek creator Gene Roddenberry's major influences. Its echo can even be heard in other, less well known works, such as Disney's The Black Hole. Based on a story by Irving Block, Forbidden Planet is the story of Commander Adams (Leslie Nielsen) and his crew, on a mission to the planet Altair IV to determine the fate of an expedition lost there twenty years previously. On arrival to the planet they discover that there are in fact survivors of the expedition living on the planet, and that the survivors harbor a terrible secret. The story itself may not seem like much today: "We went to space, we found something, sh*t got extremely real, we now regret our life choices" is a trusty and well-traveled theme in sci-fi. But this is the film where that reliable plot outline was born, and first attempts are always simplistic, especially in film. Even today, though, the story contains a number of details that set it apart from the other sci-fi fare of the era. First is the backstory. It's typical for sci-fi stories from the 50s and 60s to assume that humanity would fully colonize the Moon by about 1985 or so, and that we should be zipping about the galaxy in our hyperdrive pleasure craft by now. Not so with Forbidden Planet. This story takes a somewhat more realistic approach to scientific progress and the challenges of space travel, setting the film's events many hundreds of years in the future. The film states that hyperdrive wasn't invented until the 22nd Century, so kudos to this movie for taking the long view. That said, the film also opens with a prediction that Mankind wouldn't even land on the Moon until about the year 2090, but better to overestimate than underestimate, I say. Second, for all its fantasizing and stargazing, there's a heavy dose of science involved in this story. For example, the film acknowledges that the people inside a spaceship decelerating from high speed would have to take precautions against the effects of inertia. This is a reality that I'm surprised we don't see acknowledged in sci-fi more often; the only other time I've seen it mentioned was 1997's Event Horizon, with that film's crew avoiding inertial mishap by sealing themselves in liquid-filled chambers. Forbidden Planet doesn't get that involved, opting instead for an energy field that holds each crew member securely in place during deceleration, but the point is that this necessity is observed. Most sci-fi that I've seen ignores this fact, or worse, makes passing mention of some magical device that's never seen and always on, yet never poses any inconvenience when it isn't needed. "Inertial Dampeners" my flat foot, Roddenberry. Close your eyes and just listen to the dialogue, and there are places in this movie where you would swear it was based on an unproduced Star Trek script. By which I mean, the dialogue gets hilariously stilted and unnatural at many points throughout. Some of it is just due to the fact that this movie was made sixty years ago and language changes over time, but some of it is cartoonish self-parody. "He was warned, and now he's paid! Let him be buried with the other victims of human greed and folly!" These moments of silliness are highlighted all the more by some very snappy and memorable lines, including nearly all those spoken by the film's accidental star, Robby the Robot, who became a pop culture icon for decades following his debut in this movie, and even today. The design of the Protectrons that appear so frequently in the Fallout video game series, for example, is based heavily on Robbie's look. If I have one true complaint about this movie, it's the soundtrack. This film features the first all-electronic score in a motion picture. Credit where it's due, synthesizers weren't a thing when this movie was made, so composers Bebe and Louis Barron created the "electronic tonalities", as the film's credits refer to the score, by manipulating circuits they built themselves. Sometimes this experiment works, as the score adds to the film's sense of mystery and isolation, but other times it becomes an annoyance, even a distraction from the events on the screen. Forbidden Planet is one of those movies that every sci-fi fan should see, because of the fundamental role it played in the establishment of this genre that we love so much. There's even a chance to see Leslie Nielsen, best known today for his comedic work, in a surprisingly compelling dramatic role as Commander John J Adams. My favorite non-funny performance of Nielsen's, however, is his role in 1982's Creepshow as Richard Vickers, the villian in the segment "Something to Tide you Over." For whatever reason, though, if you like sci-fi, see this movie. It's old, and funny, and wonderful, and just as important a genre piece now as when it was made. Forbidden Planet is not rated, but includes scenes of fantasy violence.